Female genital mutilation affects around 200 million women across the world and almost all of these women will have been cut as children, many of them at school age. But FGM isn’t just an international issue, many young girls here in the UK are also at risk, an estimated 60,000 of them in fact. 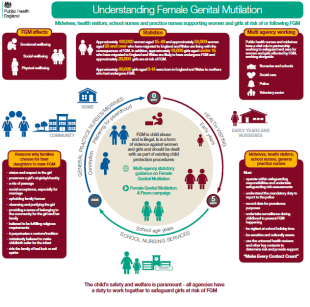 Last year the NHS treated 5,702 women and girls for FGM. Only 106 of these were known to be under 18. At first glance this figure seems reassuringly low, but with the taboo around FGM being alive and well, the truth is that many young people are still afraid to speak out or seek help. Like any form of child abuse, school nurses and health visitors can make a real difference when it comes to identifying and safeguarding girls who are at risk. As safeguarding lead for London, I see first-hand the strong professional relationships nursing teams have with schools, young people and their families and this network provides us in the NHS with a unique opportunity to start the conversation about FGM. Women and girls do have a choice, they can say no to FGM, but this will only happen if we support them with information and care. Safeguarding against FGM starts with health professionals feeling confident about asking the question and I want to urge everybody who works with women and girls to complete the FGM e-learning modules available from e-Learning for Healthcare. These cover everything you need to know about FGM, including how to communicate with patients. And the poster below is a useful reminder of how all professionals are working together to end FGM. Of course, despite the increasing awareness of the harmful effects of FGM, young girls are still being cut and one year on from the introduction of the FGM mandatory reporting duty on 31 October 2015, I want to remind my colleagues across the NHS about what this duty means for you. All regulated professionals working in health, teaching and social care must report ‘known’ cases of FGM to girls under the age of 18 directly to the police. A ’known’ case of FGM is defined as one where the girl has verbally disclosed that she has had FGM – this could be in response to a direct question from you and may be described by a different term e.g. circumcision or cutting; Or it is also described as ‘known’ if you observe the physical signs of FGM on the girl. In these circumstances, you are required to make a report to the police directly using the 101 number. All calls to 101 are handled sensitively and safely by trained agents and the case will be recorded and sent through to the local child protection response team for appropriate action, which may include further investigation. Like you, I am keen to make sure that we are kept informed about the outcomes for our patients and I am working with partners across government and the police to ensure that an effective feedback process is put in place soon. Remember the mandatory reporting duty only applies to girls under 18 who you know have had FGM. It does not replace or change your safeguarding duty and in cases where FGM is suspected or the disclosure comes from anyone other than the child, the duty does not apply but you should still follow your local safeguarding processes. I talk more about the mandatory reporting duty in a short video with NHS specialist FGM midwife Juliet Albert. It’s just a few minutes long and well worth a view. On 1 November, I will be attending the National Police Chiefs Council and Metropolitan Police Service Mandatory Reporting Seminar, this event is aimed at the multi-agency professionals to whom the mandatory reporting applies and aims to clarify the police response to the duty and to FGM in London. It is set to be an informative and useful day and I look forward to discussing these issues with many multi-agency colleagues there. 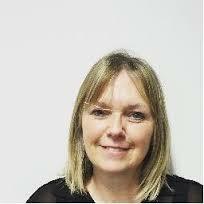 Vanessa Lodge is Director of Nursing North Central and East London and the FGM prevention national lead, NHS England.